By Tony Lee and Travis Rosiek. As a bonus, at the bottom of the article, we have included a bash shell script and (faster) Perl script to break apart McAfee BUPs from within a Linux environment. We wrote these scripts because we could not find a Linux BUP tool. It was prototyped in bash because it was quick to code and it removed as many dependencies as possible. Unfortunately, bash bitwise Exclusive or (XOR) was too slow and the tool was rewritten in (well-commented) Perl. Note that an output of 1 is only produced for an odd amount of 1’s on the input. 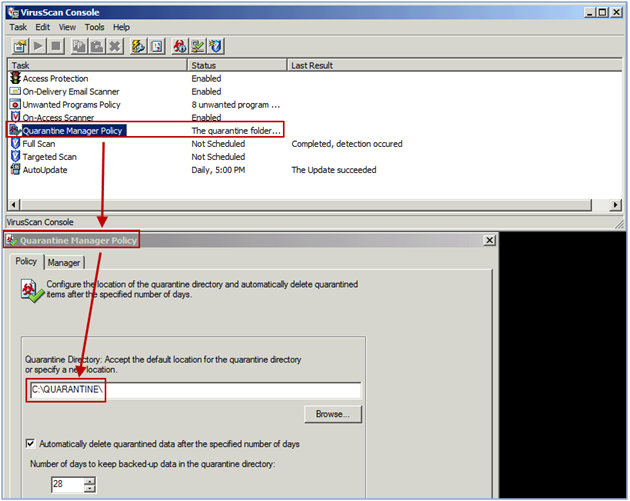 You can check the path of the quarantine folder by right clicking on the McAfee shield -> VirusScan Console -> Quarantine Manager Policy. For this demonstration, we will be using the test file for Global Threat Intelligence (GTI - formerly known as Artemis). This test file is similar to the EICAR antivirus test file, but it triggers a heuristic detection for McAfee VirusScan. You could also use John the Ripper, Cain, netcat, pwdump, or other common hack tools to trigger an A/V event. You can read more about the test file from the How to verify that GTI File Reputation is installed correctly and that endpoints can communicate with the GTI server McAfee KnowledgeBase article. If On-Access detection does not detect the file right away, right-click and scan to activate an On-Demand scan. We disabled the On-Access protection in order to run a hash on the binary and provide it for your convenience. SHA1 would normally be used as MD5 has a chance of collisions—however, MD5 hashes are sufficient for our purposes in this demo. If this file did not trigger, you may not have GTI enabled. Try to first enable GTI or use another known-safe, yet detected, binary to generate the BUP file. To extract the BUP in Windows, I followed the helpful How to restore a quarantined file not listed in the VSE Quarantine Manager McAfee KnowledgeBase article. If you are extracting the BUP on the same computer that your McAfee antivirus is running on, make sure you disable On-Access scan or exclude the target folder from scans. Use 7-zip to extract the file by right clicking it, selecting 7-Zip, then Extract Here. Now that you have the original file, you can restore it, reverse it, or whatever your heart desires. But first let’s make sure the hash from the original file matches with the hash before deactivation. For completeness, we will also provide the hash for Details.txt. We just detailed the process to recover the binary from a BUP in Windows. You can perform this same process in Linux if you have 7zip and Wine (used to run the xor.exe binary). However, the goal of this tool was to automate the process, add some features, and remove the Wine dependency. 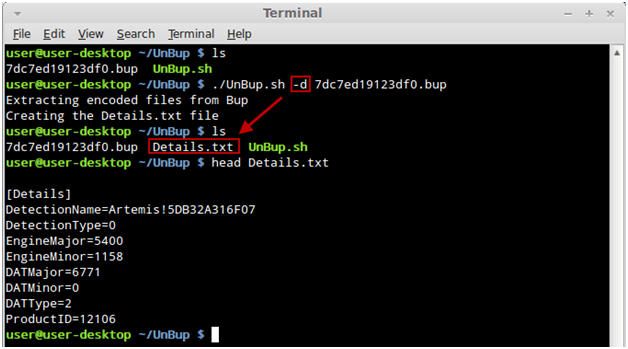 Supplying UnBup with no options and just the BUP file produces the details.txt file and the binary. 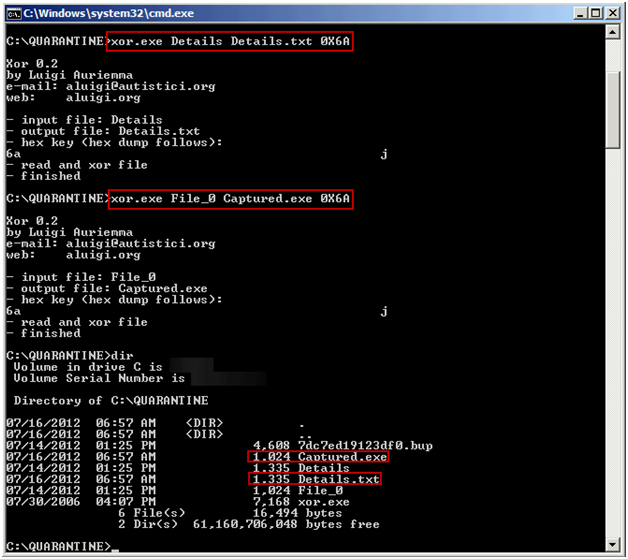 Note that the MD5 hashes are the same as what was seen in the Windows section. The -d option is useful for those who may not want to reverse or dig into the binary—but would like a little more information around the detection. The -s option is not a foolproof measure to prevent execution of the binary, however it can help prevent accidental execution. In this case, since we are extracting Windows malware in a Linux environment, this adds another level of protection as it is harder (if not impossible) to cross infect a different operating system. If you look at the supplied bash code below and think: “This must be a backdoor, there is no way I am going to run it on my box…”, then the screenshot below is directed at you. Please report bugs to Tony.Lee-at-Foundstone.com and Travis_Rosiek-at-McAfee.com"
When processing small files like the Artemis test file, bash shell scripting worked just fine. However, when processing larger executables, the XOR process was too time consuming. We searched for a simple XOR Perl script on-line, but did not find anything to fit what we were looking for so we wrote our own. 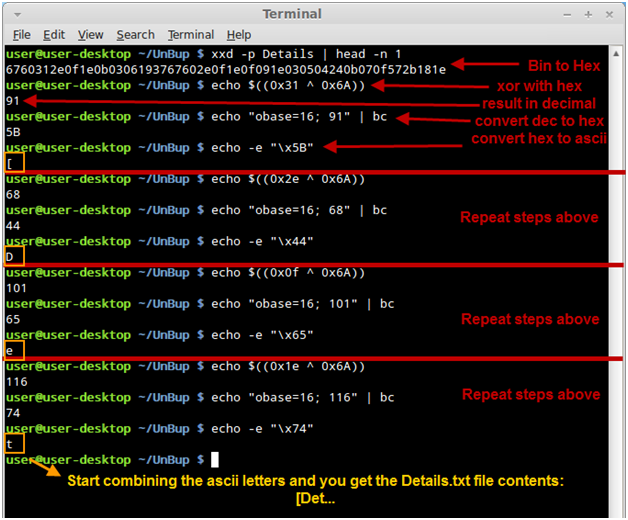 After writing the XOR Perl script, we converted the Bash script to Perl to speed the process up. Please report bugs to Tony.Lee-at-Foundstone.com and Travis_Rosiek-at-McAfee.com\n"
We provided two different methods for extracting a McAfee Bup tool in Linux. It may not be the most graceful solution—but it works and it did not take much time to hack up. However, we are looking for options that would be useful to others. If you have some options, please feel free to state what you would find useful. Feel free to post back. :) Happy hacking! Great Tool! I needed 7zip to use it. Extract with: "tar -jxvf p7zip_9.20.1_src_all.tar.bz2"
Spot on. Thank you for the reminder. Great article, it definitely set me off in the right direction but you don't actually need 7zip to extract files from a bup file. Bup files are actually CBF/OLE files not 7zip and can be manipulated with standard OLE tools. I wrote a python script to extract bup files that doesn't have any dependencies outside of python (no 7zip needed). You can find it here https://github.com/herrcore/punbup. My script also provides the option to read the Details file without extracting the whole bup to disk.